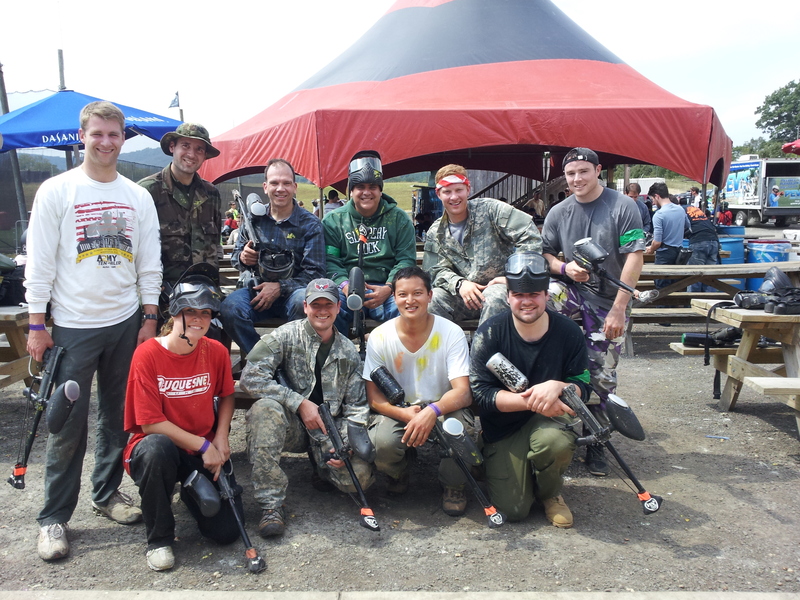 It is the profound disgust that I must report the results of the 2013 annual Torts v. Contracts Paintball competition. Contracts prevailed this year 2-1-1. The annual competition is the outcome of an auction to support our public interest law program at George Washington University. These contests have raised thousands of dollars of indigent clients and public interest work. Our team fought heroically despite the last minute substitution of a team member who missed his flight coming back from the Michigan game. In an inspiring move, Samantha agreed to step forward to fill the slot to fight for the honor of torts. Dean Greg Maggs and his team were able to redeem the position of Contracts after last year’s loss to Torts. We were able to win one and tie one, but contracts came out with two wins. The two hour battle had moments of breathtaking heroism and self-sacrifice on both sides. Through the haze of paint and sweat, every player rose to the occasion to put themselves into harm’s way. Each of the torts team members carried a picture of Learned Hand with them as a talisman. Obviously, Maggs had found some greater contractual juju to pull out the win. My thanks to the inspiring torts members composed Jonathan Foster, Shane Huang, Patrick Scotti, and Samantha Thompson. Congratulations to the contract team with Dean Maggs: Vladimir Semendyai, Conner Prochaska, Travis Jordan, and Michael Bain. Suffice it to say that Titans of Torts will return to the field of battle again and will write our names into history in the paint left on the backs of our fallen contractual foes. Sadly, I appear to be the only person who views “paintball” as doing the forbidden: with malice aforethought, using a “firearm” against a person. I’ve “paintballed” using modified S&W handguns in tactical training. That training re-enforced the idea that paintballs are a substitute for live munitions, while the objective – shooting a person, remains constant. I’d hope the school may find a better avenue for revenue, benefitting a worthy program. How can that be when a contract waives a tort….is this like paper, scissors, rock? At least Da Bears won!
. . . and gbk wins the Internet. It is inspiring to see future lawyers take such a militaristic stance so early in their careers. I think the Torts team needs to assume more risk. Torts shall prevail next year! Defeat is no where to be found in torts’s lexicon: comeback is what we believe in! The altruistic “thousands of dollars [for] indigent clients and public interest work” requires public admiration. I would not be surprised to learn they were carrying a picture of James Clark McReynolds as a talisman. What other explanation could there be? Kudos to the man in the white shirt in front. Looks like he took one three for the team. It was obviously the pictures of John Edward Murray the K team was carrying. Dastardly black magic.